To begin: I am not a fan of SUVs. They are impractical for the city, too inefficient for long distances. That’s why it took me a while to warm up with the Audi e-tron, after deliveries finally started last week. Even picking up the car from the Audi City Berlin underground car park was a spatial challenge. It bears mentioning that I got hold of the electric SUV via the regular test drive program. There are no press vehicles yet. The car came as an antigua blue special model with virtual exterior mirrors, 21-inch forged wheels, orange brake callipers and black sports seats – and thus belongs to the limited “Launch Edition” at an impressive fixed price of 105,900 euros, gross. Getting out of town, I felt much more comfortable with Audi’s first large-series electric car in the vastness of Brandenburg. The chassis of the electric car also showed its strengths there, evening out bumps in the country road almost impalpably away. And the dimensions of the car – 4.90 metres long and 1.94 metres wide (without mirrors) – here no longer played a role. After two days in the country, I was wondering who might like this electric SUV: Farmers, for example, who have a lot of space and harvest electricity from wind, sun or biomass. Some tours on dirt roads and bad roads lacked any kind of neck punches, which I am used to from my BMW i3 or the briefly tested Tesla Model 3. 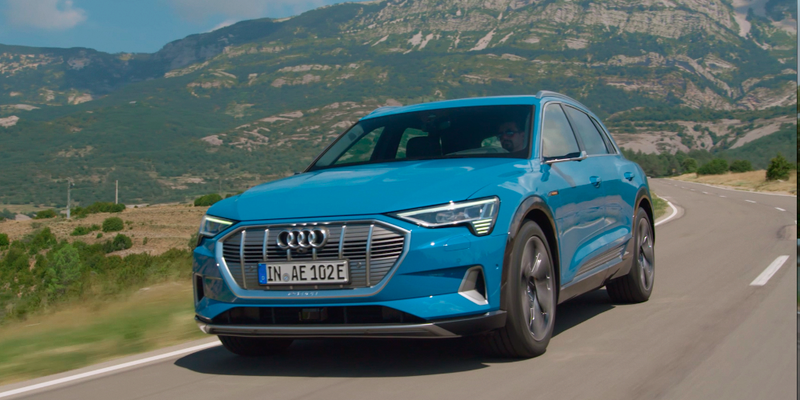 Which brings us to the topic: Is the Audi e-tron a true Tesla fighter or not? There is no definite answer after only two and a half days with the electric vehicle. I was in too much of a hurry on the trips to and from Berlin, where the consumption was between 28 and 33 kWh (with comfortable use) per 100 km. But the Audi can’t keep up when it comes to sprints. The 300 kW that the two asynchronous motors in the front and rear are capable of mobilizing is just enough for 5.7 seconds. This is neither decisive nor a miracle for such a space glider with an empty weight of just under 2.5 tons – and, it is slower than all available variants of the Tesla Model X (from 3.1 to 5.2 seconds). On the other hand, the Audi emphasises comfort. The workmanship is outstanding. Propulsion and recuperation unfold extremely harmoniously in the e-tron. The engineers from Ingolstadt obviously wanted to avoid occupants being tossed about while driving. The e-tron sounds like a spacecraft both when accelerating and decelerating, which is supposed to attract the attention of the regular clientele used to driving dynamics acoustics in an interior that is otherwise pleasantly insulated from external noise. Especially when operating the digitally designed cockpit, less could have been more. Here Tesla demonstrates how it is done. Some e-tron menus go unnecessarily far in depth, and the strength of the recuperation and even the charge level of the battery are displayed too small. Countless views and settings may please the experienced Audi driver. The newcomer, on the other hand, is initially overwhelmed. I couldn’t get used to the electronic exterior mirrors at all, the power of habit always makes me look outwards to see nothing but the aerodynamically effective cameras. The small screens in the door, which always deliver a high-precision image, are simply too low. Visuals aside, the e-tron shows a pleasingly strong performance at the charging station. At a 100 kW system in Neuruppin, Brandenburg, the direct current charging capacity via CCS shot up to just under 90 kW despite the still quite generous filling level (67% SOC). Audi has heat dissipation under control with its lithium-ion battery with a gross energy content of 95 kWh (usable are just under 84 kWh). Cooling noises like those of the competition are hardly audible. Unfortunately, I wasn’t close to any HPC charging station nearby to test charging with the maximum possible 150 kW. The position of the charging socket between the left front wheel and the driver’s door is probably too low for people with weak backs. Well solved: A second AC connection on the right side of the vehicle can be ordered as an option. The onboard charger with 11 kW is suitable for practical use; optionally a second one doubles the alternating current flow to 22 kW. Let us now turn to the two big Rs – range and recuperation. The former is given as up to 417 kilometres according to WLTP. However, I drove the e-tron without regard to efficiency, which regular customers would probably do as well. I was therefore not shown much more than 300 kilometres after being fully charged in winter temperatures. The recuperation at first seems unusually mild and can be adjusted in three stages via shift paddles on the steering wheel. It was only after a few tours that I noticed how dynamically the automatic thrust-recuperation regulates the power gain. Here the developers have devised a fine system. They call it a predictive efficiency assistant. The practice looks like this: If you take your foot off the power pedal outside a town, the e-tron first coasts, before then recuperating more and more powerfully, finally reaching the appropriate permitted speed when reaching a city or town. A similar situation occurs when approaching vehicles in front. What experienced electric car drivers control with one-pedal driving is controlled by the car itself. I got used to this kind of electric braking – with up to 300 Nm torque and 220 kW electrical power by the way – quickly and gladly. All in all, the two and a half days in the Audi e-tron were only a first approximation. For valid consumption measurements on different roads and at different temperatures, a long-term test would be required. After about 400 kilometres, it is a kind of interim conclusion that the brand with the four rings can significantly reduce Tesla’s lead with the e-tron. The electric SUV was developed for regular Audi customers and therefore does not pick up experienced electric drivers in all respects. The e-tron convinces with its charging concept and recuperation, and less with its efficiency and range. Let’s look at it positively: if this car can win over loyal Audi buyers to electromobility, a lot has already been won.